veganmartha | A practical guide to a healthy vegan lifestyle that will save the animals, the planet, and YOU! I’m a huge fan of just throwing everything in a crockpot. It’s SO easy! 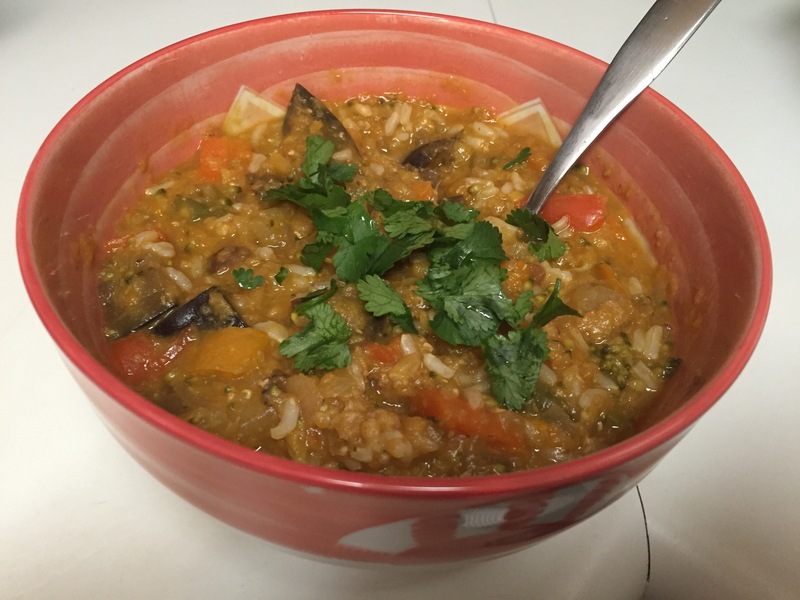 The crockpot is my answer to anyone who complains that vegan diet and/or meal prep is too much work…nope! Easy peasy! You can use whatever veggies you want, this is just a guide. Throw everything in the crockpot. Cook on low for 8 hours. If you don’t have a crockpot…go get one!!!! Then garnish with cilantro and/or Thai Basil. You could even top with some chopped cashews or peanuts if you’d like. In a food processor, combine bananas, pitted dates, protein powder, cinnamon and flax eggs. Process until blended. Next, pulse in the flour and 1 cup oats just until combined. Then, pour mixture into a mixing bowl and stir in the remaining 1 cup oats and the walnuts (and hempseed if using). Fold in the peaches & raspberries. Use 1/3 cup measure to scoop into 2 non-stick muffin tins (or greased sticky ones) (12 muffins total), scraping the sides with a spatula to move the muffin to the center (it will be easier to scrape out). This was a bit of an experiment but it was a great success!!! Preheat oven to 325°. 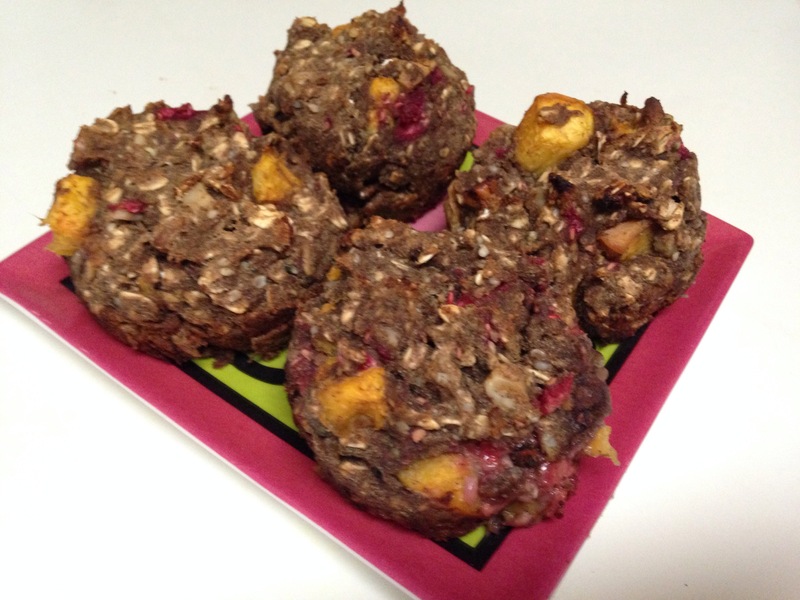 In a food processor, combine bananas, pitted dates, protein powder, cinnamon and flax eggs. Process until blended. Next, pulse in the oats just until combined. Then, pour mixture into a mixing bowl and stir in the flour and 1/2 cup of the chopped walnuts. Fold in the blueberries. Use 1/3 cup measure to scoop into 2 non-stick muffin tins (or greased sticky ones) (12 muffins total), scraping the sides with a spatula to move the muffin to the center (it will be easier to scrape out). 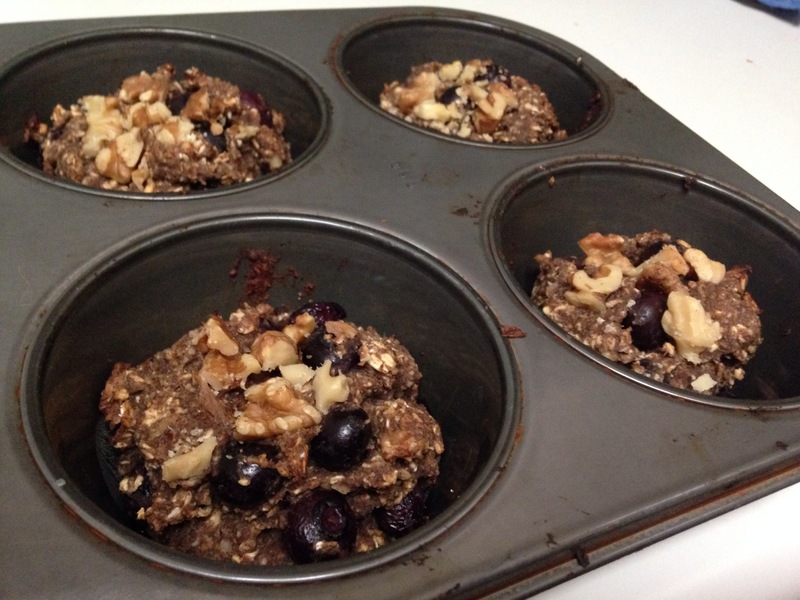 Finally, sprinkle the muffins with the remaining 1/4 cup of walnuts and bake for about 25 minutes. Enjoy!!! Makes about 6 hefty servings! Begin by heating the coconut oil and adding the lightly steamed sweet potatoes. Then add the steamed tempeh, garlic and spices (including the chipotles in adobo.) Add veggie broth as needed to deglaze the pan. Sauté for a few minutes until done. 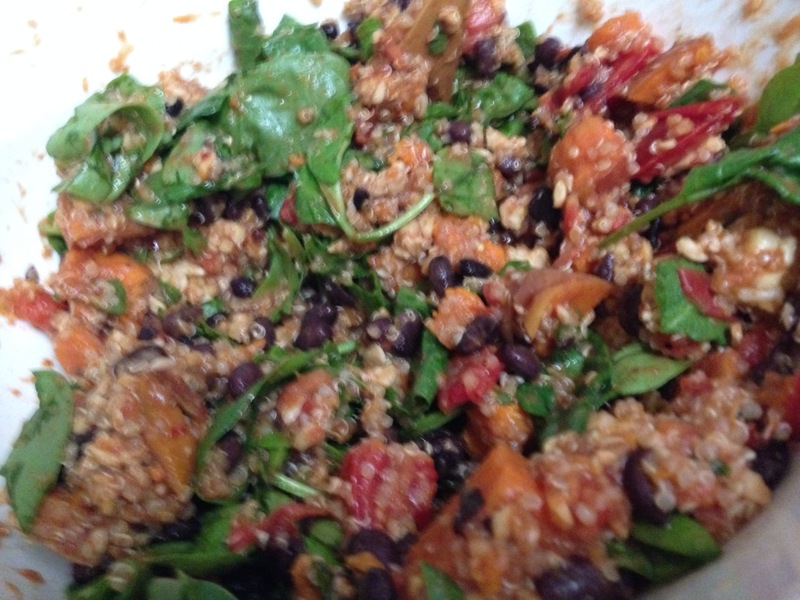 Then place in a mixing bowl with the black beans, quinoa, tomatoes and baby spinach. Stir thoroughly. When ready to serve, add the toppings to each bowl to taste. Add hot sauce if needed. You can also add scallions and/or cilantro if you like. Enjoy! Put the coconut water, probiotic powder, soaked & drained cashews, and shredded coconut in your VitaMix or high-speed blender. Blend until smooth. Let the blender get nice and warm. Let sit overnight. Then add the lemon juice and blend with extra coconut water if needed for desired consistency. Keeps in the fridge for about two weeks. Enjoy! 1/2 cup water or enough to achieve desired consistency. Blend! *This will not keep as long as the yogurt so eat quickly or halve the recipe. 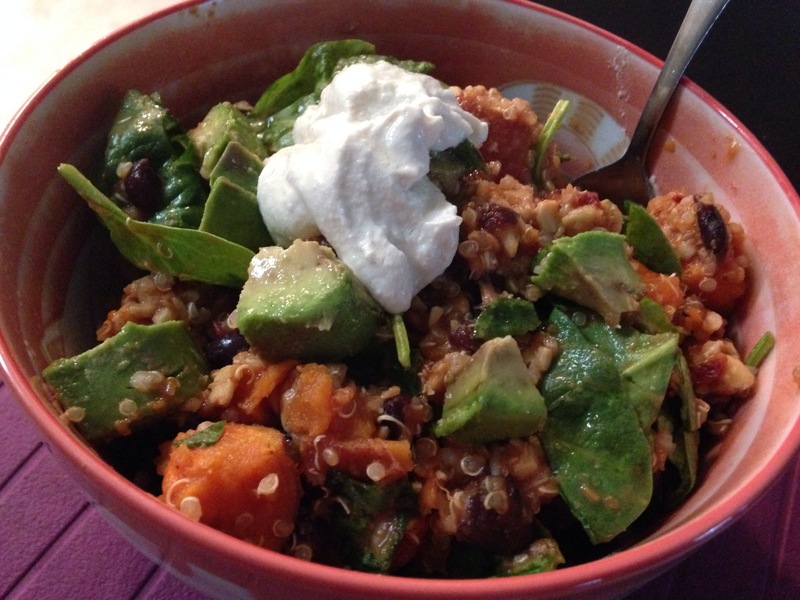 Prepare and combine all salad ingredients in a large bowl. Place all ingredients in a high-speed blender and blend until combined. Mix in with salad and enjoy!!! Makes about 5 entree-sized servings. This is pretty spectacular. I started with this recipe. It has many parts to it. If I made it again I’d leave out the corn. Don’t get me wrong I love corn on the cob on a hot summer night or frozen corn in a Mexican soup or chili. But here it seems a bit out of place. And there is just so much goodness here besides that! 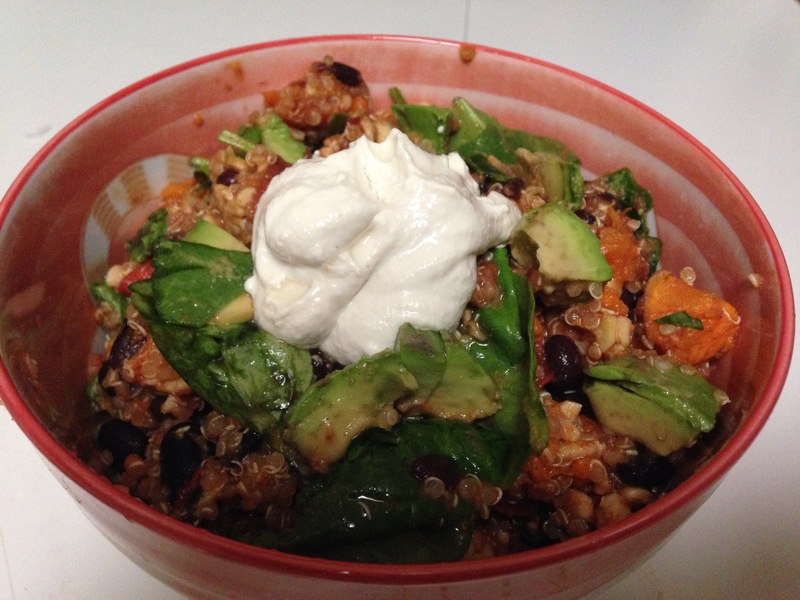 Cauliflower rice. I sautéed it in coconut oil, garlic & ginger as suggested in the main recipe. I also added broccoli! It was delicious, especially with the teriyaki sauce. Teriyaki gazed sweet potatoes with homemade Teriyaki sauce. The sauce was the best part. I used the recipe as a guide but I didn’t use any sugar. I added balsamic vinegar which is very sweet, in addition to the Mirin and rice vinegar (also sweet) & other ingredients (except the sake). I ended up with 2 cups total before cooking. Once I simmered to reduce it, it was plenty sweet!!! Yummmmm!! Top with green onions, sesame seeds & more teriyaki sauce! Enjoy. But I don’t need to tell you that.